Habit: Perennial herb, non-green, parasitic. Stem: < 1.5 m. Leaf: 5--25 mm, linear to triangular, glandular. 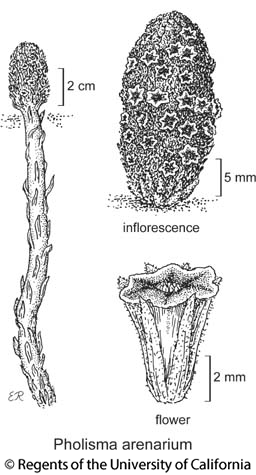 Flower: 7--10 mm; ovary chambers 10--32. Fruit: capsule, +- circumscissile below middle. Pholisma arenarium Nutt. ex Hook. Stem: 3--8 dm, 1--2 cm diam. Flower: calyx lobes linear to spoon-shaped; corolla lavender to blue-purple, abaxially puberulent, margin white; ovary chambers 10--20. Chromosomes: 2n=36. Ecology: Uncommon. Sandy soil, coastal dunes, chaparral, desert; Elevation: < 1900 m. Bioregional Distribution: CCo, SCo, PR, D; Distribution Outside California: western Arizona, northwestern Mexico. Flowering Time: Apr--Jul, Oct Note: Parasitic on Croton, Eriodictyon, various shrubby Asteraceae. Citation for this treatment: George Yatskievych 2012, Pholisma arenarium, in Jepson Flora Project (eds.) Jepson eFlora, http://ucjeps.berkeley.edu/eflora/eflora_display.php?tid=37881, accessed on April 19, 2019. CCo, SCo, PR, D; Markers link to CCH specimen records. Yellow markers indicate records that may provide evidence for eFlora range revision or may have georeferencing or identification issues. Purple markers indicate specimens collected from a garden, greenhouse, or other non-wild location.